This component focuses on the Maldives archipelago: 2000 coralline islands that stretch out in a thin double-chain approximately 900km north to south, and 700km from west coast of Sri Lanka. 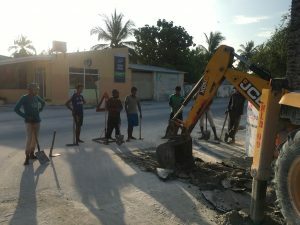 While the islands of the Maldives are not undergoing ambitious projects of large scale rural road development and mega-highway construction, as can be seen in India and Pakistan, physical development presents a different set of complex infrastructural and engineering challenges, which require specific technical and financial responses and resources. 90% of the territory’s surface area is water, land rises to only a couple of meters above sea level, and the contours of the landscape are constantly shifting with the changing currents and rising tides. Focusing on actors across a broad spectrum of the development industry. The project intersects the field of infrastructure development and connectivity at three distinct sites. (1) It addresses development consultancy and the type of brokerage and subcontracting required to bring about large-scale structural changes on the ground. (2) It traces the development link-roads and bridges that connect previously discrete islands. (3) It engages ethnographically with the everyday work of road development and construction; working with road crews and the Maldives Road Development Company (MRDC) on site to observe how roads are built. The research examines practices and processes of infrastructure development from the air-conditioned offices of contractors and construction firms to the casting yards on site. The mutual implications of the development industry, and the private and commercial sectors variously interested in the processes and outcomes are brought to bear in the evaluation of what facilitates structural change in the Maldives. 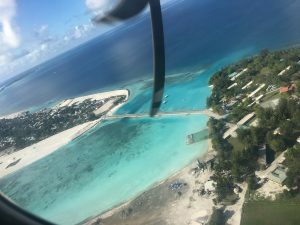 Maldivian consultancy companies offer advisory services and local technical expertise for infrastructural interventions and development projects of various scales ($100 million +). Based at FJS Consulting Pvt. Ltd., a firm in Malé, Dr Heslop has been conducting research into the consultancy industry. One vital aspect of the work these companies do is the formal assessment of potential impacts on the environment that infrastructure development may entail. This involves pre-construction mitigation, on-going monitoring, and post-construction evaluation. This aspect of the research provides a window into the administrative side of development practice and process, as international bilateral and multi-lateral grants awarded to the Maldivian government are contracted out to a growing number of local firms. The culture of consultancy in the Maldives: the necessary mediation of infrastructural change on a small island and the requirement of a local partner is connected to financial features of developing industry and infrastructure on the archipelago, notably, the emergence of joint ventures projects and public-private partnerships. A particular focus of the research in the greater Malé region has been the construction and development of the Malé-Hulhulé Friendship Bridge. 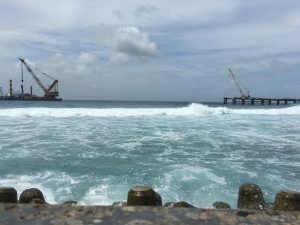 Whilst the bridge has long been part of a public, infrastructural, and political imaginary in the Maldives, it has begun to be realised at pace through a project loan from the Exim Bank of China and the work of the Chinese subsidiary, China Communications Construction Company Ltd (CCCC). The research explores how, in its anticipation, as an ambitious new structural feature of archipelagic-connectivity, the bridge impacts on how people imagine ways of working, living, commuting, and being connected in the Maldives. To this end Dr Heslop has been conducting interviews with those investing in the land at either side of the bridge (Malé and Hulhumalé) as well as working with the Housing Development Corporation of Maldives to explore the effects the bridge has had on property investment and development. his has involved interviews with the Bank of Maldives and the Housing Development Finance Corporation Plc . Dr Heslop has also worked with Government Ministers central to the planning and initial design of the bridge. As well assessing the impact of the bridge from an investment perspective with developers, contractors and real-estate agents, Dr Heslop has interviewed individuals hoping to move to Hulhumalé, a new island developed through large-scale reclamation and marketed as ‘City of Hope’, thus building a more personal perspective on the social and aspirational importance of the Friendship Bridge for Maldivians. In Addu, the Maldive’s southern-most atoll, the project focuses on a 17 km link road which connects five previously discrete islands. The islands of this atoll are subject to an historical and political economy of development that has been uniquely shaped by the presence of the RAF in the early 20th century, a brief and brutal encounter with regional sovereignty in the mid 20th century, and life on the periphery of dictatorship that focused heavily on a project of centralisation in the late 20th century. The construction of the road and the contiguity it has offered, though generally welcomed, has had a mixed impact on the islands 30,000 plus population. To explore this, Dr Heslop has interviewed master-planners and Ministers involved in the construction of the link road, as well as worked at the casting yard and the roadside with the Maldives Road Development Corporation (MRDC). He has also met with politicians in the offices of the Addu City Council, to explore the challenges faced by various stakeholders in the construction and maintenance of a road across the islands. To further understand the complex ways in which the link road has influenced movement on the island Dr Heslop has worked with the Addu Women’s Development Committee (WDC) and groups of young men to explore diverse gendered experiences of small island mobility. Laamu is the largest atoll in the Maldives, consisting of 12 inhabited islands it has a total population of around 15,000 people (not including expatriate workers). The link road runs through four elongate islands running north to south on the eastern chain of the archipelago. Starting with the southernmost, the islands are Fonadhoo, Kadhdhoo, Maandhoo, and Gan. The road itself is considered to Maldives most developed. It was constructed by the Chinese subsidiary developer, Jiangsu Transportation Engineering Group (J-TEG) and given to the Maldives as a ‘gift’ from the Chinese government. It is known in the Maldives as the ‘Chinese link road’. The gift of 15 asphalted kilometres of road is thought to be part of securing a host of projects for Chinese subsidiary companies in the region. 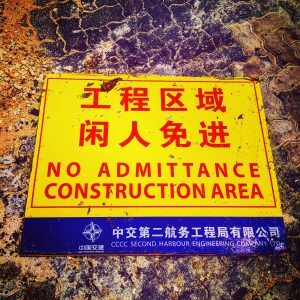 This aspect of the project looks at the role of reimbursable government-to-government financing on development and the implementation and implications of mega projects on small islands. 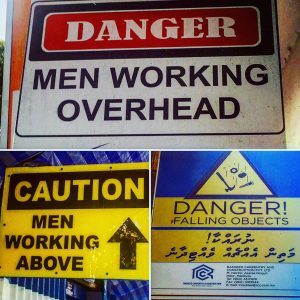 This aspect of the research project engages ethnographically with the everyday work of road development and construction; working with road crews and the Maldives Road Development Company (MRDC) on site to observe how roads are built. It follows the teams of workers on a contract to build a road network across seven islands in different regions of the archipelago. The contract was awarded to a Sri Lankan construction company, one of several working in the Maldives, with who Dr Heslop worked. The research leading to these results has received funding from the European Research Council under the European Union's Seventh Framework Programme (FP/2007-2013) / ERC Grant Agreement n. 616393. The contents of this website reflect its various author’s views and the European Union is not liable for any use that may be made of the information contained therein.